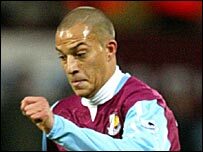 Hayden Mullins and Bobby Zamora scored the goals that ensured West Ham ended Norwich's FA Cup dreams in the third round for the second year running. Norwich fell behind on six minutes when Mullins shot in off the post. Marlon Harewood hit the post just before Robert Green's howler literally handed Zamora the ball to make it 2-0. Paul McVeigh's penalty after James Collins' handball made it 2-1 and Ian Henderson nearly equalised after Green was stretchered off with a head injury. Zamora set up the opener when he worked his way up the left-hand touch-line and laid the ball back to Mullins to lash home from just outside the box. West Ham quickly imposed themselves on the game, and only a lunging clearance by Craig Fleming prevented Zamora connecting with Matthew Etherington's lay-off from the left and doubling the lead. As the half wore on, Norwich began to find their way into the game, with McVeigh posing most of the threat. But they rarely managed to find a way past the fit-again Danny Gabbidon and Tomas Repka, with Jason Jarrett's long-range effort easily saved by Shaka Hislop. Just after the restart Zamora and Harewood both flashed shots inches wide before Harewood rattled the post with a flying volley. Zamora finally made it 2-0 when Etherington's left-wing cross deceived Norwich keeper Green, who dropped the ball into Zamora's path for the easiest of close-range headers. After McVeigh and Henderson had tested Hislop, McVeigh finally pulled one back for the home side after James Collins conceded a penalty for handball. Green was stretchered off with a head injury late on after being accidentally caught by Harewood's shin. Norwich: Green (Ward 89), Jarrett (Spillane 87), Fleming, Doherty, Drury, Henderson, Etuhu, Charlton, Rossi Jarvis (Cave-Brown 90), Thorne, McVeigh. Subs Not Used: Shackell, Brennan. West Ham: Hislop, Repka, Gabbidon, Collins, Konchesky, Newton, Mullins (Fletcher 68), Reo-Coker, Etherington (Dailly 79), Harewood, Zamora (Katan 81). Subs Not Used: Bywater, Aliadiere. Goals: Mullins 6, Zamora 57.